Art by Neil Roberts, Pharos book cover. For Scythes of the Emperor fans and many readers of Warhammer 30k/40k fiction that Games Workshop draws a lot of inspiration from wars of antiquity to imbue legend among the origins of the Imperium and the great heroes and villains that shaped the history of mankind in the stars of the 41st millennium. On reading the book, Pharos by Guy Hayley, a novel follow up to A Safe and Shadowed Place and the prior use/research of the Pharos device in Unremembered Empire. 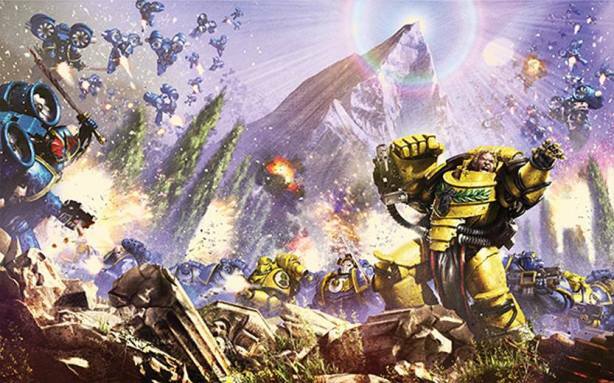 I was put to wonder, about the mountain that the Ultramarines whom founded the Scythes of the Emperor originated protected and what inspired this literal plot device? It was easily discovered and whilst I had known of the Alexandria Lighthouse, I did not recall the title Pharos associated to it. 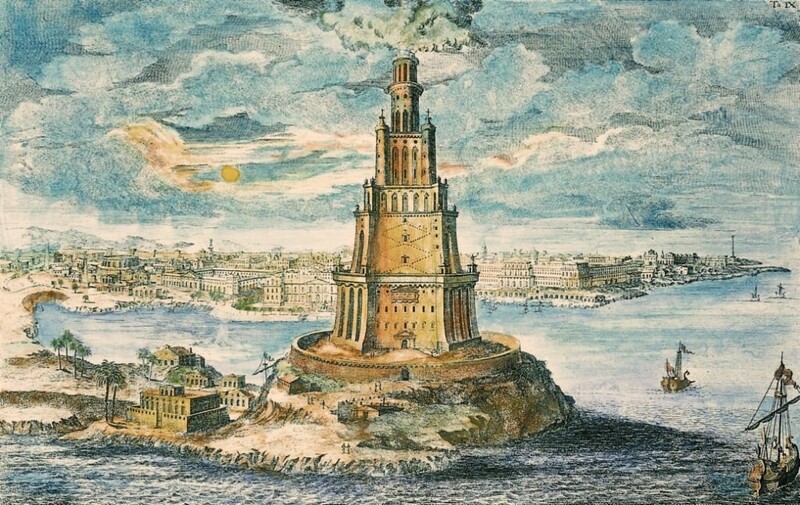 The Lighthouse of Alexandria, sometimes called the Pharos of Alexandria was a lighthouse built by the Ptolemaic Kingdom between 280 and 247 BC which was between 394 and 449 ft tall. It was one of the Seven Wonders of the Ancient World and one of the tallest man-made structures in the world for many centuries. Badly damaged by three earthquakes between AD 956 and 1323, it then became an abandoned ruin. It was the third longest surviving ancient wonder (after the Mausoleum at Halicarnassus and the extant Great Pyramid of Giza) until 1480. 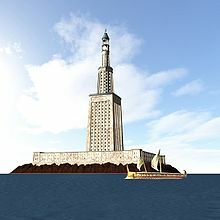 Pharos, was actually a small island located on the western edge of the Nile Delta. Applied to the lighthouse, the name became a noun through many cultures even today when related to light. Even Russians use a derived word, fara, for headlight! In 332 BC Alexander the Great founded the city of Alexandria on an isthmus opposite to Pharos. Alexandria and Pharos were later connected by a mole (stone pile pier in essence) spanning more than 1200 metres. The east side of the mole became the Great Harbour, now an open bay; on the west side lay the port of Eunostos, with its inner basin Kibotos, now vastly enlarged to form the modern harbour. 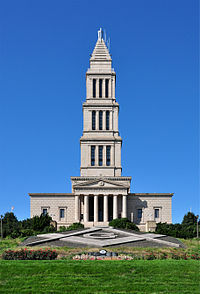 The Pharos remains an icon of Alexandria and even inspired the styled construction of the Pharos of Abusir and the George Washington Masonic National Memorial located in Alexandria, Virginia. Connections to 30k Horus Heresy. When reading history in antiquity, you see the many inspirations from this region and period. The young Alexander who strode forth and carved out the empire of the Greeks, founding Alexandria itself. Not unlike the God-Emperor of Man. Or in the least a template of Roboute Gulliman creating the ‘Empire of 500 worlds’. The expansion and construction of the Pharos not only was a wonder, but created a greater harbour at Alexandria, and a safer one at that. The concept receives several nods in Unremembered Empire – providing a guiding light in the warp storms. The historical mention of a giant mirror during the day emboldens the idea of the intense light the fiction Pharos Device shines. Then there is the mole, which connects the island of Pharos to Alexandria, one of the second most recognised Greek founded cities. It is little leap to see the crossing from Sotha to Macragge using the device as the remarkable construction that connected Pharos to the mainland. Most notable quote from ancient times is by Julius Caesar, in his Civil Wars (Part III, 111–112), describing the Pharos and its strategic importance. 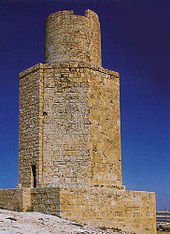 Gaining control of the lighthouse helped him subdue Ptolemy XIV’s armies (48 BC). This certainly fits how many see Roboute Guilliman and his efforts for stability in the Horus Heresy civil war. This would again seem an indulgent article in hobby lore, like my Falx article; however the scope of history explored and the great effects such items, places and constructions have had on human history (and science fiction) are always worth acknowledging and exploring. I also suspect a lot of inspiration for what Sotha looked like could be drawn from Greco-Egyptian themes as found in ancient Alexandria.